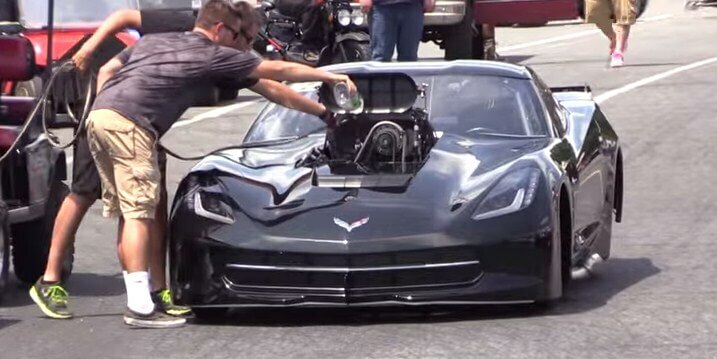 This badass Outlaw Drag Radial Chevy Corvette C7 is killing at the strip pulling 4's!!! This badass Outlaw Drag Radial Chevy Corvette C7 is killing at the strip pulling 4’s!!! This badass Outlaw Drag Radial Chevy Corvette C7 is killing at the strip pulling 4’s!!! Drag racing world is full of badass Chevy C7 Corvettes, but this C7 is one of the best out there. The famed Outlaw 10.5 racer is stepping up once again with a 2014 Chevrolet Corvette being turned into the most innovative 10.5 car in the pits for the upcoming season. The man behind the wheel of this wild Outlaw 10.5 car is Chuck Ulsch, and in the video he is making a few passes at Cecil County Dragway’s Street Car Shootout. Vanishing Point Race Cars and Gil Mobley have loaded the Mobley Racing Corvette with carbon fiber, keeping the weight down as much as possible. This C7 monster Corvette is packing a huge punch with a powerful Brad Anderson HEMI with a PSI screw supercharger providing the massive amounts of boost needed to run the big numbers that the team is looking to run. The Lencodrive transmission will transfer all that horsepower through the driveline to the Mark Williams modular rear end housing which will turn the Mickey Thompson 33 x 10.5W slicks and plant the power and torque to the concrete! This supercharged beast makes that kind of noise that will scare the life out of everyone within a 5-mile radius. And it will roar in your ears long after it’s gone! How Ignition System Works – Know The Basic Working Of An Automobile Ignition System! The Punisher biker club helped a bullied 7 year old girl!